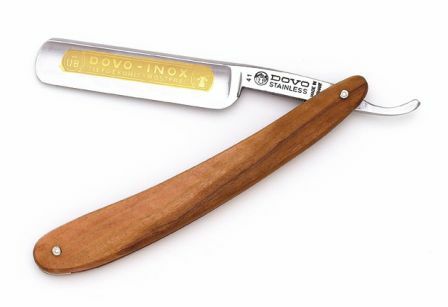 The Dovo Inox Olivewood Round Tip 5/8″ straight has a genuine exotic olivewood handle with gold plated spacer. The blade is stainless steel with a hollow grind and a 24k gold etch of the brand. It has file jimps on the underside of the tang. The blade and handle are balanced for a great shave. Most straight razors are not pre-sharpened from the factory. All of our straight razors are honed by our honemeister and delivered to you shave ready.